It’s a long dull drive from Harlech to London. And as I had badly ricked my back moving furniture and could barely walk, let alone heft and carry which is my usual rôle, I was looking forward to it even less than usual. I watched uselessly as Von cleaned, tidied and packed up. Finally the dog and two cats were loaded into the car. Bembo, the black cat, really resents being shut in a cat basket and howls to be let out, while Bodoni, the tabby, accepts it placidly. Bembo has to be uncaged during the trip. He then remains in his opened basket, staring malevolently at the oncoming traffic. Milo the hyperactive golden retriever sits in the boot panting ceaselessly. I needed to drive as unexpected jolts really hurt my back — driving allowed me to anticipate them. Left hand corners were OK, right hand bends hurt a lot. I got to Toddington before I became so uncomfortable I couldn’t carry on, and Von took over. The hour’s delay on the M6 at Spaghetti Junction due to a rolling road block didn’t help. We needed tomatoes for our supper so we stopped at the Kwik-E-Mart at the bottom of Ferme Park Road. Von got out of the car — and so did Bembo. Like a streak of black lightning he was out of the car and over the busy road. I shouted, Von yelled and the cat sprinted. I sat there paralysed, because I was — I really couldn’t move because of my back. I sat watching my cat sprinting up the road to oblivion, and part of me wondered at how fast he could run. Von was running hopelessly after him, calling his name but what chance was there that a cat would stop, turn round and saunter back down the hill and entwine himself round her legs? Right. She came back to the car, white-faced and drained. “I’m so sorry, I’m so sorry” she kept repeating. But it wasn’t her fault, neither of us had remembered Bembo was loose. We drove slowly up the hill. The shop is 500 yards from our house, round the corner in another road. I had to get out halfway up the hill just because I had to. I crabbed slowly, bent over double, inching from house to house, calling “Bembo, Bembo” rather feebly. No sign of him. I gained the house, partly helped carry some of the stuff inside. 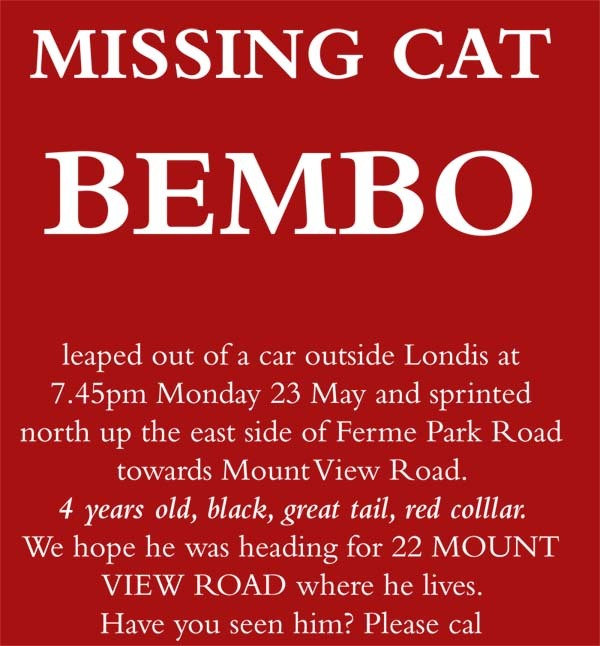 Before feeding our remaining cat and dog I sat down and started preparing a Cat Missing poster. And there was Bembo. Unfazed, unruffled and very, very hungry after 5 hours in the car and a quick run up the hill. He had come straight back to the house. It was some time later that evening before the back pain returned. But the smiles didn’t go. I’m not really interested in posthumous fame. I want it while I’m still alive. But I’ve noted with interest how often the spouses, lovers or partners of famous people seem to come up strongly on the outside — after the race is run. Nowadays they’re often running well ahead, but it’s way too late for them to enjoy any fruits of fame. I offer just two examples where the male partner’s fame vastly transcended the other’s during their lifetimes, but look where they are now. You will doubtless be able to come up with many more examples. Read Ted Hughes’s remarkable poem on swifts which I posted on this blog a few days ago, and ponder why he has receded in the public eye. The British Public has spoken — a resounding NO! to changing our first-past-the-post voting system to something fairer but more complicated. A really interesting graphic in the paper this morning showed the country in various shades of green for NO and purple for YES. We got a big green island, with five tiny patches of purple — Central London, Oxford, Cambridge, Edinburgh Central and Glasgow Kelvin. Isn’t that interesting? I wonder if voters in Oxford, Cambridge and central London, Edinburgh and Glasgow are above or below average intelligence? The swifts, that is. My favourite birds. Yesterday I saw three circling high above Crouch End. Of course Von had seen two the day before but then she’s got hawk eyes and I’ve just broken my glasses. Time for some Ted Hughes, I think. And if you can read that without a tear coming to your eye, you’re a harder man than I.